The Lady Nimue never perspires; she may occasionally be seen to glow, having made friends with her inner athlete. I, however, sweat. I excel at sweating. I’d embarrass myself sweating, but then I might as well regret breathing. Thus, wicking or “moisture transport” clothing is useful to us. I remember my first experimental purchases, wondering: will this actually work? Or is it just another fitness fad? My results were good: I ran or hiked without feeling quite so much like I’d just emerged from a pool. So I acquired more. When Nimue started walking miles a day, we got her wicking wear as well. 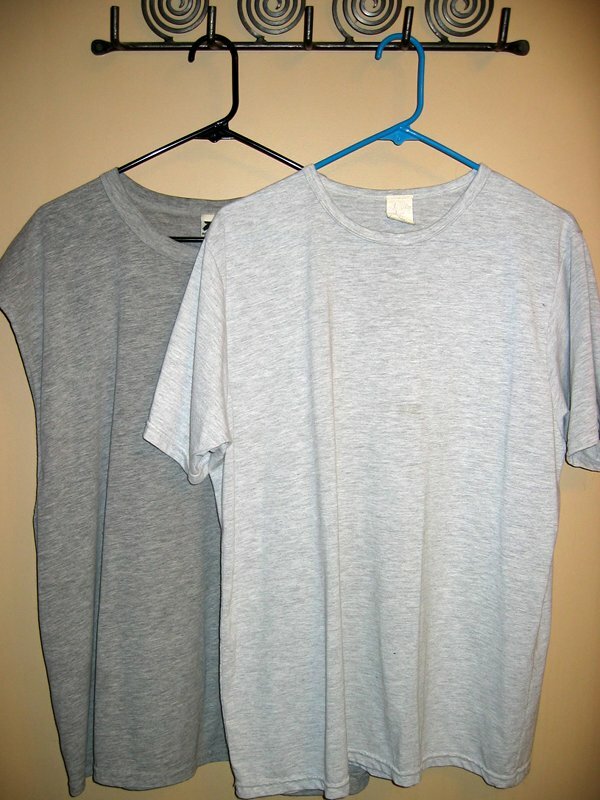 Then some ride directors (whose drawers are overflowing with cotton tees, too) thoughtfully started specifying wicking fabrics for the shirts for their events. And suddenly we had too much of a good thing. Here, however, are two for the give-away box, one from each of us. Sometimes the first shed is the hardest, they say. A journey of a thousand relinquishments begins with a single shed. And supposedly Eleanor Roosevelt counseled, “A little simplification would be the first shed toward rational living, I think.” I do, too. Something wicking this way comes. Comments welcome … what kinds of things are strangely hard for you to let go of? 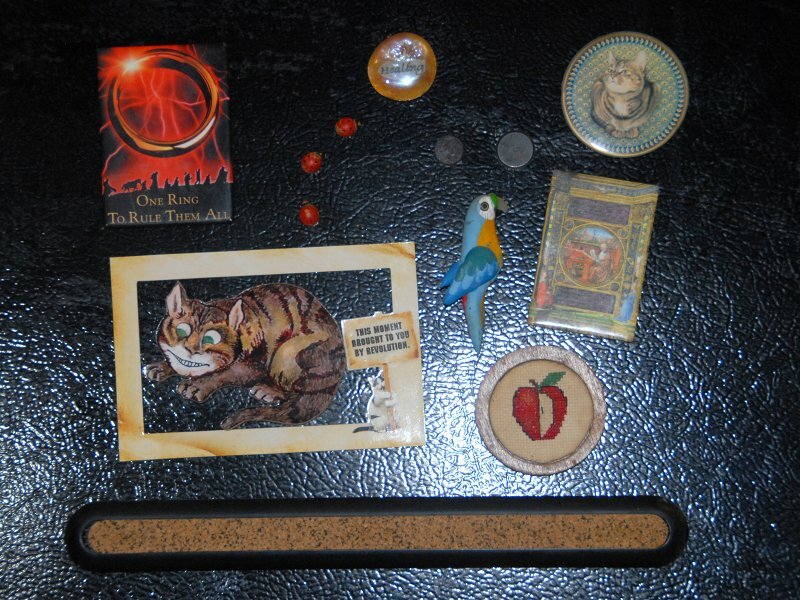 Having made a good beginning yesterday, today Nimue and I reviewed the rest of our refrigerator magnets. For now we’re keeping nine: seven are holding up 3×5 cards on which we write goals or other pertinances, another is a handy clip for coupons, and the last reminds us to “Keep calm and carry on” (still a good watch-word, despite its faddish currency). Those in the picture have been bagged for transfer to the thrift store. Some of what fluttered under these also has been shed, into the recycle bin. Comments welcome … having begun as you mean to continue, might you modestly “carry on” today? 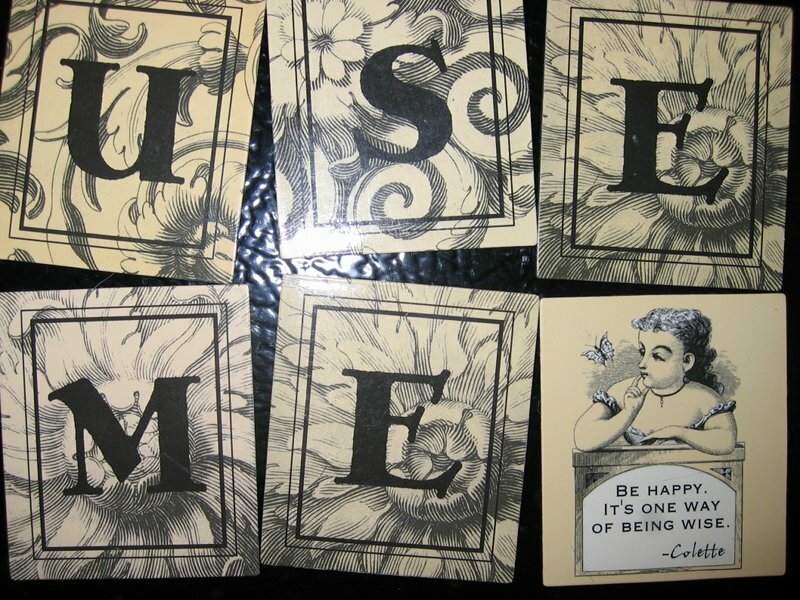 After I culled the recipes off the fridge, Nimue remembered a refrigerator magnet set we received some years ago. At first we amused ourselves leaving messages for one another, but the novelty wore off, and the tiles joined the number of cluttery things we don’t really notice but are part of our background noise of disorder. I’m not sure when we took them down and put them back in their box. After Minimalist Sometimes raised the bar for me by commenting that she’s cleaned her refrigerator of all but one magnet, I’d be embarrassed to get them out again! They are literary and rather nice, and might serve well in a household with creative kids. They’re bound for the thrift store, where I hope that family will discover them for gleeful, long use. Someone else’s refrigerator magnet set is on our fridge door! 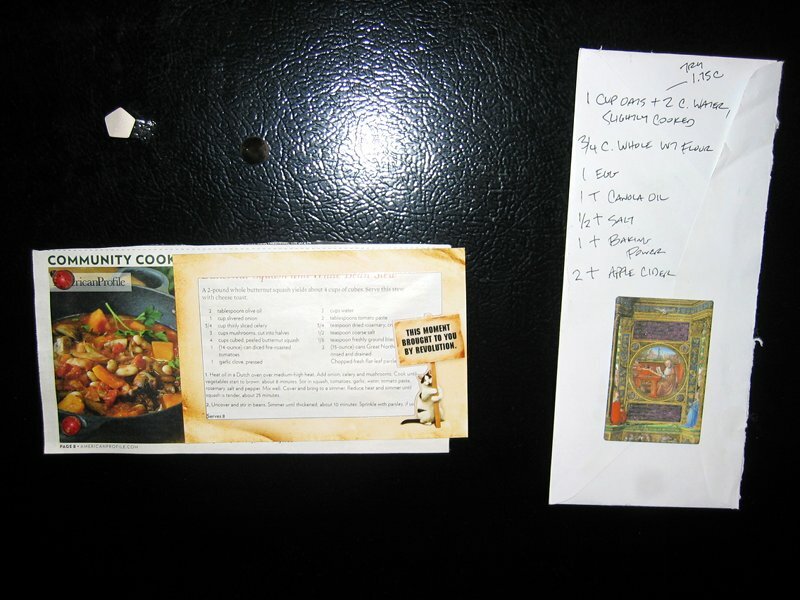 Comments welcome … shall we all count our refrigerator magnets and come clean in the comments? So, in our version of a witness protection program, we whisked the little chest into the lair of Tiamat, the primordial chaos dragon (the upstairs junk room). But there it couldn’t fulfill its intended use. All it did was grow a coat of mold during last summer, when the US southern piedmont was impersonating a rain forest. Now it has a use. It can be today’s shed. I’ve sanded off the mold and filled the scratches. After I apply a coat or two of sealer, I’ll offer it up on craigslist for less than we paid for it. Which wasn’t much more than a large pizza. “Noooo! 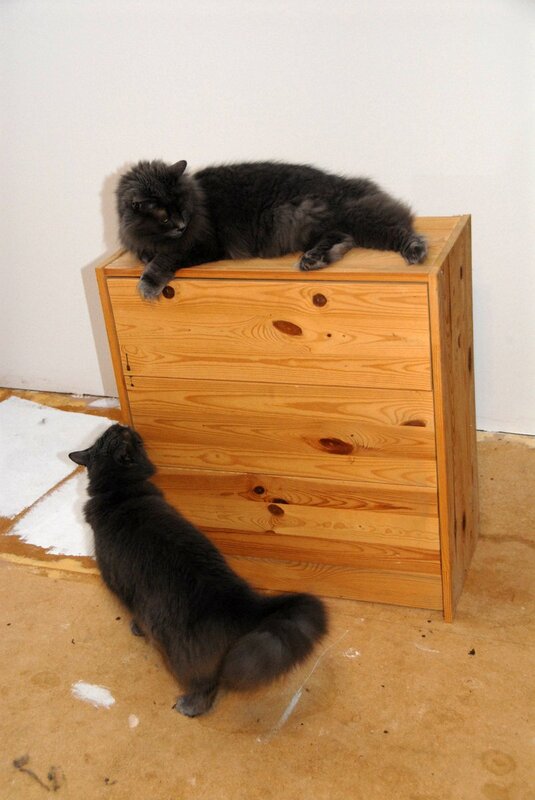 You can’t get rid of our scratching chest! Comments welcome … what do you have that hasn’t worked in your ecosystem? Some months ago, Nimue and I committed to a semi-annual refrigerator deep cleaning and purge. To hold ourselves to it, we entered it as a repeating event on our joint Google calendar. The next such occasion falls Saturday week. (“Saturday week,” should that puzzle you, is a British expression, also current in the southern US, that means “the Saturday following next Saturday.”) Look, on that auspicious day, for us to shed the vintage oil-cured olives and last autumn’s green tomato pickles by eating them, if they’re palatable. But back to today’s shed—refrigerators collect magnets, and refrigerator magnets collect items under them. Ours have affinities for coupons (frequently expired), notices from our city-county government, and recipes. I decided that, with the purge of the refrigerator’s contents coming up, this was a good time to cull the paper coating the fridge’s skin. Fortuitously, I made the winter-squash and white bean stew this week. Though I agree with my mother (who passed the recipe along) that it was quite good, I’d stew something new before I tried it again. The one for panini-grill-cooked oatcakes we developed by trial-and-error has become something of a standard, so I’ll transfer it to a 3×5 card. And probably affix it to the refrigerator with a magnet (sigh) … otherwise I don’t know how we’d find it in a future still wanting a considerable amount of decluttering with attendant creation of orderly systems. Comments welcome … is your refrigerator a-flutter with information that might better be kept somewhere else? During the second of three periods I spent as a poor graduate student (which was the poorest), as a gift-giving holiday approached, my parents asked me what I wanted. “A pressure cooker,” I answered. For ethical reasons, I’d begun trying to eat lower on the food chain. For simple economy, I based my diet on beans and rice. A pressure cooker can cut the cooking time of legumes from two hours to 20 minutes, which meant less time spent as a poor, hungry grad student. I still have and use the 4-quart pressure cooker Mom and Dad gave me that Christmas thirty years ago. It’s been joined by a huge model we use for home canning, and a mid-sized cooker I saved from a neighbor’s trash bin. (Their shed, my gain.) The smaller two double as stock pots, pasta boilers, and (blush) popcorn poppers. But they still see weekly use as originally intended, to quickly cook dense foods under higher than atmospheric pressure. This magic depends, however, on good seals, which age attacks and heat destroys. Lately the little pot has been leaking steam when I cook the weekly batch of pintos. I know from past experiments that I could get another two or three months out of the seal by coating it with vegetable oil before use. But simplifying my life is teaching me when to act—which is usually some species of now! 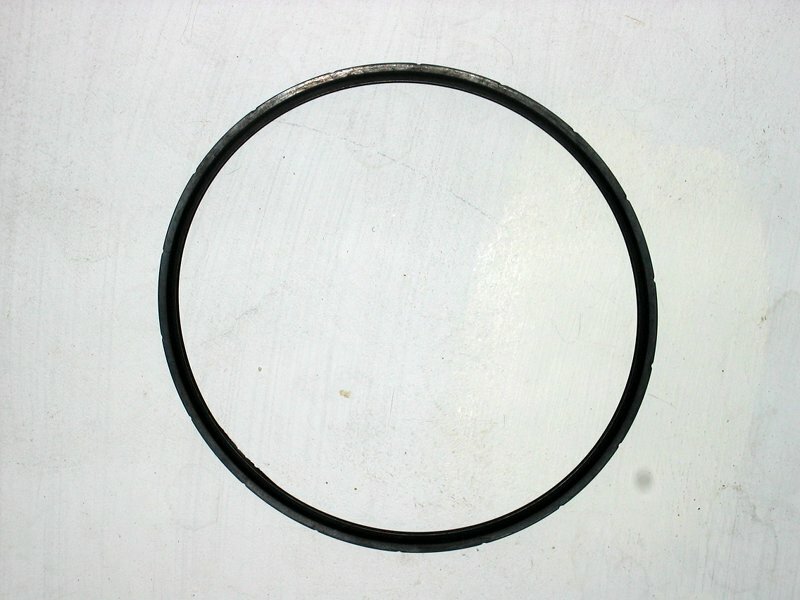 The Great Department Store in the Cloud will get a chance to fulfill an order for a “Presto Pressure Cooker Sealing Ring/Automatic Air Vent Pack (3 – 4 Quart).” I last ordered one in 2009. Its length of service isn’t bad bad economy, I judge. Though it may look otherwise, the circle isn’t unbroken. Comments welcome … do any of your tools of daily living need replacement parts? As a benefit for joining an organization, I recently received a lunch bag. It’s kinda nice … has a silvery insulated liner that recalls the space survival blankets Edmund Scientific sold when I was a kid, and a velcro-closure pocket big enough for—I don’t want to say “pack of Lucky Strikes”—er, deck of cards. We kept it awhile, because it seemed it ought to be useful. Yesterday, while I was packing a meal to take on a tandem ride, Nimue retrieved it from our picnic kit. I opened it as wide as it would go, but it would swallow only one portion of pseudo-lasagna cassarole. That wouldn’t do; we took our old REI lunch ice box instead. So it seems we already had a lunch container that better meets our needs. 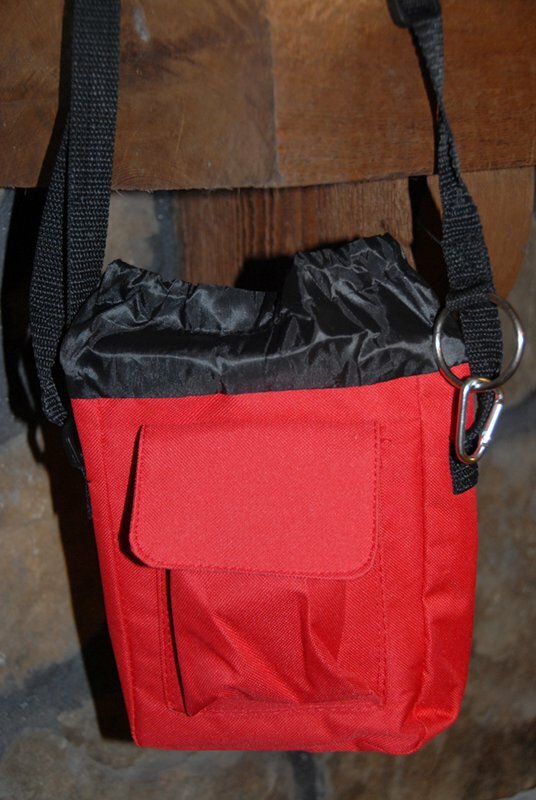 The red lunch bag shall be shed, that someone else may warm or coolly be fed! I really do wonder what the designers intended one should put in that front pocket. Comments welcome … what “might be useful” items have you keep that could receive their trial? Several years ago our municipality realized that the landfill (an expensive and finite resource) would last longer and generate less methane if leaves, limbs, and grass clippings were kept out of it. So residential yard wastes are picked up every few weeks as part of basic services. It’s required, however, that they be stuffed into special kraft paper bags, which are sold at several stores. The solid waste division chips or shreds the collected materials, combines them with sludge from wastewater treatment, and makes compost that it sells to recover part of the costs of the program. In general, I think this is all a good thing. But the energy inputs just for hauling are fairly high. I prefer to simply let our fallen leaves lie, where they become humus and enhance the soil. I rake up some of our leaves for my own mulching and composting, but as those activities have scaled up, I sometimes find myself coveting my neighbors’s leaf bags awaiting pickup. It’s possible that I might even occasionally have asked someone, “May I have your leaves?” I’m not admitting so, understand, because once they’re in those bags, the city-county considers them property of the public. 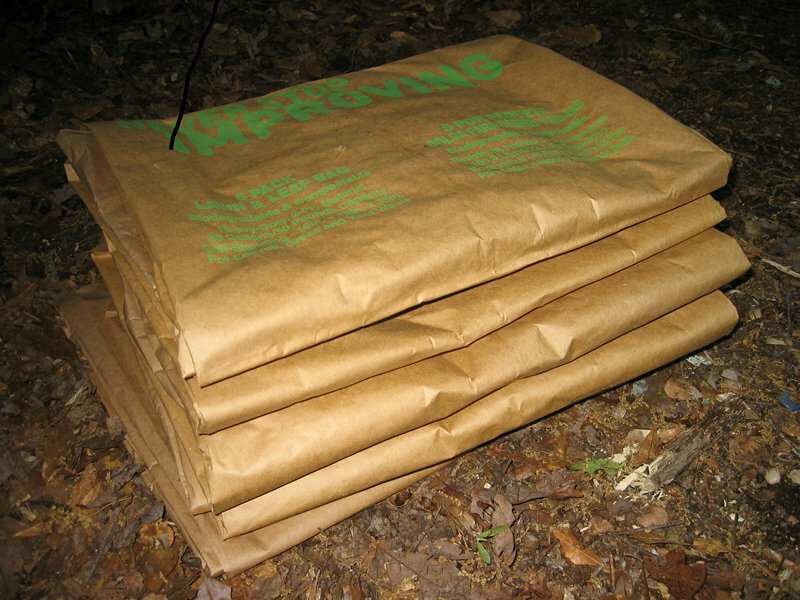 For today’s shed, however, I folded up six lawn and leaf bags that had been drying out in our garage and left them on the porch of a neighbor I know makes use of them. Comments welcome … do you have someone else’s stuff cluttering your space that you might return?